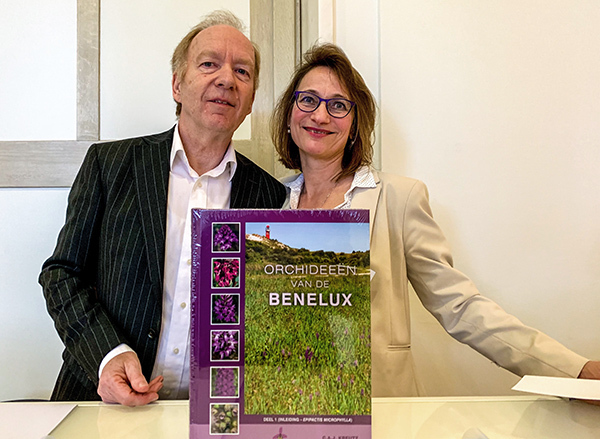 Among the lecturers was Daniel Tyteca of the Catholic University of Louvain, who presented the orchids of the Belgian regions Famenne and Calestienne. In the nature reserve of Lesse et Lomme alone, there are 31 species. Some of them, as Epipactis microphylla (2004), have only been proven a few years ago. Tyteca also pointed to colour variants of Anacamptis morio and Orchis mascula. Those are shown in the book of Kreutz with special photos, as far as there are findings in the three Benelux countries. Albiflora forms are also shown of Dactylorhiza fuchsii, but interestingly not of Dactylorhiza maculata, Dactylorhiza majalis or Dactylorhiza incarnata – though there are albiflora forms of those species in other European regions. With Orchis militaris, Orchis simia and Orchis purpurea albiflora forms are also missing. Anacamptis pyramidalis is shown with a picture of an albiflora form of var. dunensis, which has been described by Londo, Kreutz and Sings in 2016. A hypochrome form of Ophrys apifera is also shown. 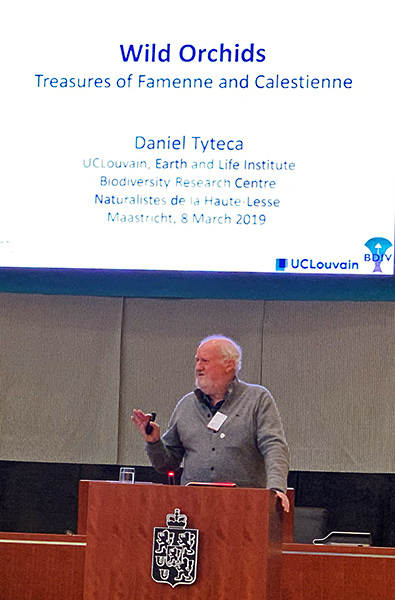 With regard to taxonomy Karel Kreutz is following the genus system of Daniel Tyteca and Erich Klein presented in 2008. Therefore Anacamptis morio is named Herorchis morio, Neotinea ustulata is Odontorchis ustulata. And Anacamptis laxiflora is introduced as Paludorchis laxiflora. But Kreutz is holding on to Aceras anthrophora und Listera ovata. The author concedes: Over taxonomie kan men sterk van mening verschillen – when it comes to taxonomy there are big differences of opinions. Zo is het onmogelijk om in dit werk een taxonomische indeling te hanteren, die voor iedereen aanvaardbaar is – therefore its not possible to present a classification which could be accepted by everybody. sei eine für alle akzeptable Klassifizierung nicht möglich. At least it would be desirable if the register at the end would also include the names which are used beyond the system of Tyteca & Klein. 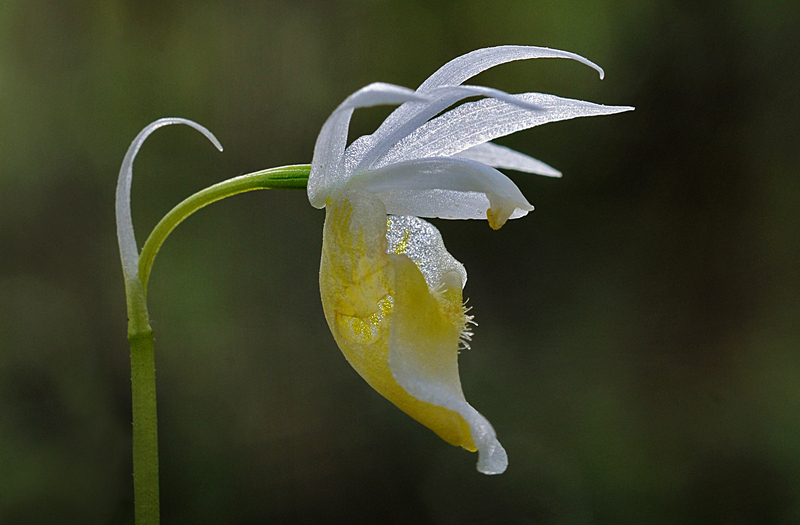 In his opus Orchids of the Crimea, published together with Alexander Fateryga and Sergej Ivanov in 2018, Kreutz still followed the taxonomy which was developed by Richard Bateman, Alec Pridgeon und Marc Chase in 1997. The author explains the change to the system von Tyteca and Klein with their more recent genetical studies – although the conclusions are still controversial. Next year Karel Kreutz will present a field guide Orchids of Europe, North Africa and the Middle East. Later on there is to follow a complete overview of the European orchids in ten volumes – expected for 2021/22, as it was announced in Maastricht. Since Pierre Delforge is following the taxonomic system of Tyteca and Klein since the 4. edition of his opus Orchidées d’Europe (2016), this taxonomy might achieve a broader acceptance in future. Zu den Referenten gehörte Daniel Tyteca von der Katholischen Universität Louvain (Löwen), der die Orchideen der belgischen Regionen Famenne und Calestienne vorstellte. Allein im Nationalpark Lesse et Lomme gibt es 31 Arten, von denen einige wie Epipactis microphylla (2004) erst vor wenigen Jahren erstmals nachgewiesen wurden. Tyteca wies auch auf Farbvarianten von Anacamptis morio und Orchis mascula hin. Diese sind in dem Werk von Kreutz mit eigenen Abbildungen gewürdigt, soweit es Funde in den drei Benelux-Ländern gibt. Albiflora-Formen werden so auch von Dactylorhiza fuchsii gezeigt, interessanterweise aber nicht aber von Dactylorhiza maculata, Dactylorhiza majalis und auch nicht von Dactylorhiza incarnata – während diese Arten in anderen Regionen durchaus mit Albiflora-Formen vertreten sind. 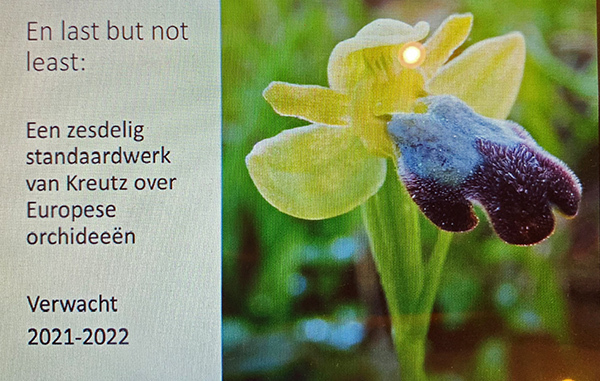 Auch von Orchis militaris, Orchis simia und Orchis purpurea sind keine Albiflora-Formen belegt. Anacamptis pyramidalis ist in dem Werk mit der Abbildung einer Albiflora-Form der var. dunensis vertreten, die 2016 von Londo, Kreutz und Sings beschrieben wurde. Hypochrome Formen sind auch von Ophrys apifera vertreten. In der Taxonomie folgt Karel Kreutz dem 2008 von Daniel Tyteca und Erich Klein entwickelten Gattungssystem. 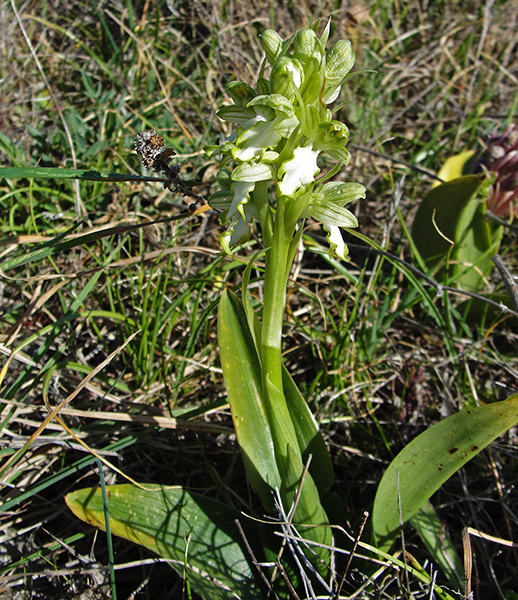 Somit wird Anacamptis morio als Herorchis morio bezeichnet, Neotinea ustulata als Odontorchis ustulata. 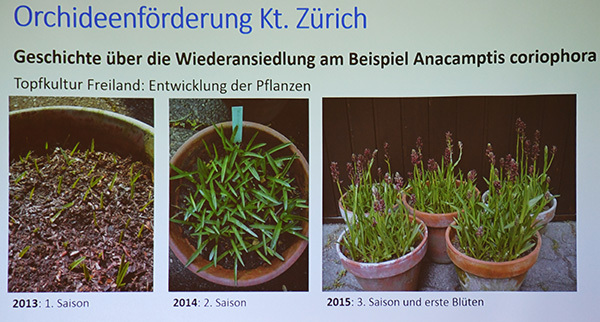 Und Anacamptis laxiflora wird als Paludorchis laxiflora geführt. Umgekehrt hält Kreutz an Aceras anthrophora und Listera ovata fest. Der Autor räumt ein: Over taxonomie kan men sterk van mening verschillen – zur Taxonomie gibt es große Meinungsverschiedenheiten. Zo is het onmogelijk om in dit werk een taxonomische indeling te hanteren, die voor iedereen aanvaardbaar is – somit sei eine für alle akzeptable Klassifizierung nicht möglich. Gewünscht hätte man sich dann aber zumindest im abschließenden Register, dass auch die jenseits von Tyteca & Klein gebräuchlichen Namen zum Nachschlagen berücksichtigt würden. In seinem 2018 veröffentlichten Werk Orchids of the Crimea, verfasst mit Alexander Fateryga und Sergej Ivanov, folgte Kreutz noch der 1997 vorgelegten Taxonomie von Richard Bateman, Alec Pridgeon und Marc Chase. Den Wechsel auf das System von Tyteca und Klein begründet der Autor mit deren neueren genetischen Untersuchungen, auch wenn die daraus gezogenen Schlussfolgerungen umstritten sind. Im nächsten Jahr will Karel Kreutz zunächst einen Feldführer Orchids of Europe, North Africa and the Middle East vorlegen. Diesem soll dann ein Gesamtwerk zu den Orchideen Europas in zehn Bänden folgen – zu erwarten für 2021/22, wie es in Maastricht hieß. Da auch Pierre Delforge seit der 4. Ausgabe seines Werks Orchidées d’Europe (2016) dem taxonomischen System von Tyteca und Klein folgt, dürfte dieses allein vom Gewicht der Veröffentlichungen her künftig weitere Verbreitung gewinnen. In einem Beitrag für das Journal Europäischer Orchideen (Vol. 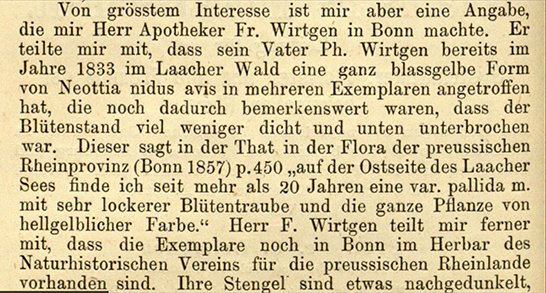 50, 2-4, 2018, p. 221-226) gibt Leslie Lewis einen Überblick zu den hypochromen Formen von Neottia nidus-avis. Sie erklärt einführend, dass diese Orchideen an Farbpigmenten durchaus Chlorophyll und auch Carotinoide enthalten. Gleichwohl werden auch gelegentlich Farbvarianten gefunden, schreibt die Autorin. 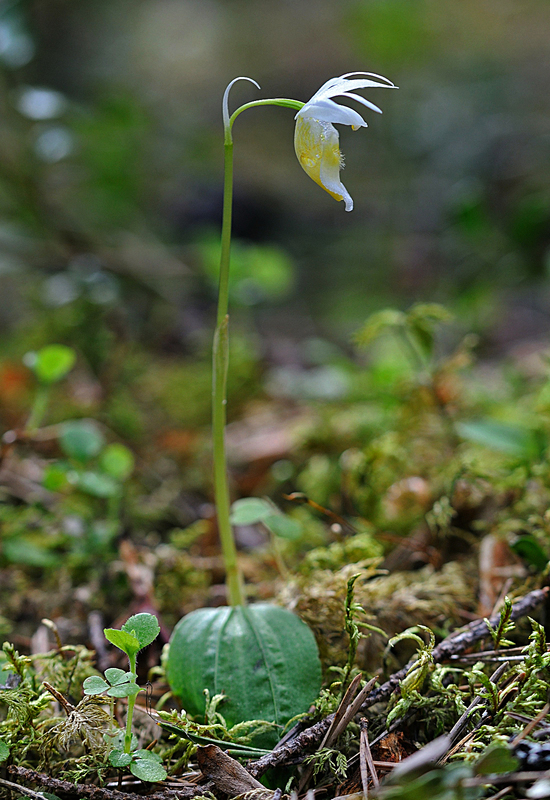 At the edge of the Arctic, Calypso bulbosa is one of the most Northern orchids. After snow smelting, from April to June, the plant is flowering in Northern Sweden or in Canada. It has rose to violet petals, the lip has a white or rose ground, with rose or violet spots. Albiflora forms are extremely rare. In the Canadian National Park Banff, Jeroen Gerdes has found a white-flowered plant which still has its purplish color pattern in its hypochil. A purely white-flowered plant has been found this year by Marco Klueber in the Swedish province of Dalarna gefunden – here all the Anthocyanine pigments are vanished. The small plants grows in moist coniferous forests, on moss grounds. It’s a real dream to find it in this white-flowered form. Am Rand der Arktis ist Calypso bulbosa eine der nördlichsten Orchideen. Nach der Schneeschmelze, von April bis Juni blüht sie in Nordschweden oder auch in Kanada. Sie hat rosa bis violett gefärbte Kelchblätter, die Lippe hat eine weiße bis rosa Grundfarbe mit rosa oder gelben Flecken. Albiflora-Formen sind äußerst selten. Jeroen Gerdes hat im kanadischen Nationalpark Banff eine weiß blühende Pflanze gefunden, die im Hypochil noch das purpurfarbene Farbmuster hat. Eine ganz weiß blühende Pflanze hat Marco Klüber in diesem Jahr in der schwedischen Provinz Dalarna gefunden – hier sind die Anthocyanin-Pigmente völlig verschwunden. Die kleine Pflanze wächst in feuchten Nadelwäldern, auf Moosboden. Sie in dieser weiß blühenden Form aufzufinden, ist ein Traum. 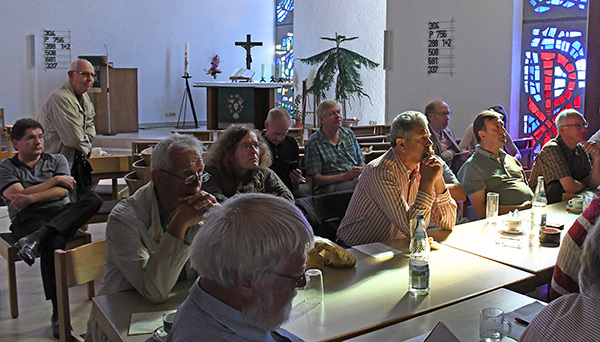 An unusual rescue mission in the canton Zurich was subject of the 2018 orchids conference in Kehl-Neumuehl, Germany. In this Swiss region, nutrient-poor grassland and bright forests have been dramatically reduced, René Gaemperle explained. Reasons are – as in other regions – the over fertilization of the intense agriculture and the increased building activity: “Where the hills are most beautiful, country residences are built”, Gaemperle said. In order to strengthen weak populations like Ophrys araneola, Gaemperle cooperated with officials and organized manual pollination, collection of seeds, mixture of seeds with river sand and sowing. If the appropriate symbiosis fungus is in soil, this method works rather soon, explained Gaemperle. The time from sowing to first flowering is just three to six years. 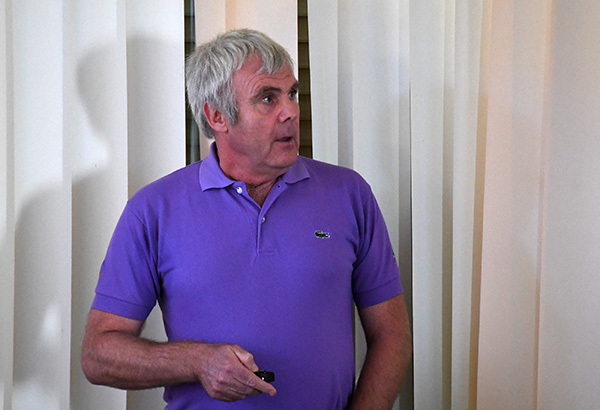 Threatened orchid species are also an issue for Peter Steinfeld who lectured about the nature reservate Bliesgau in the German state of Saarland. Steinfeld has been observing the changes of the regional flora for 35 years. 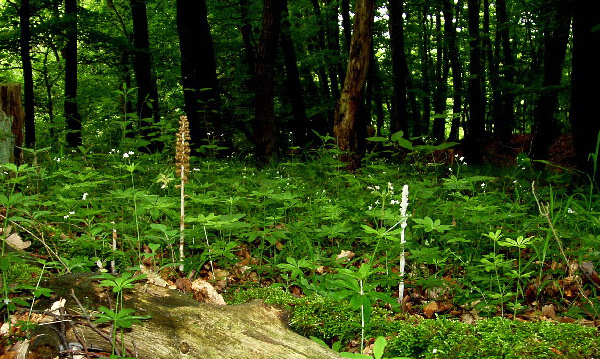 According to him, Cephalanthera rubra is threatened by extinction in Saarland – he found the last flowering plants in Bliesgau about 20 years ago. 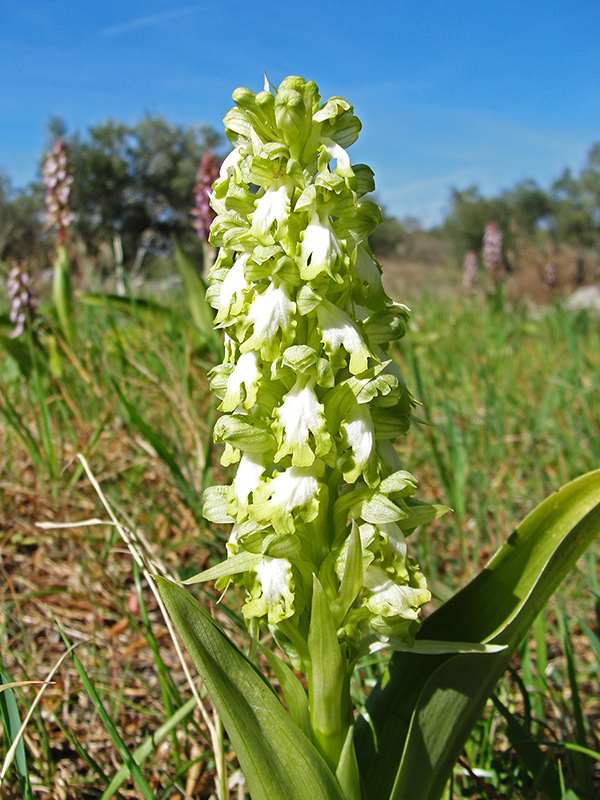 Heavily decreasing is also Dactylorhiza viridis. But Limodorum abortivum is expanding, probably coming from the French region of Lorraine. The same case is with Ophrys sphegodes and Orchis simia. 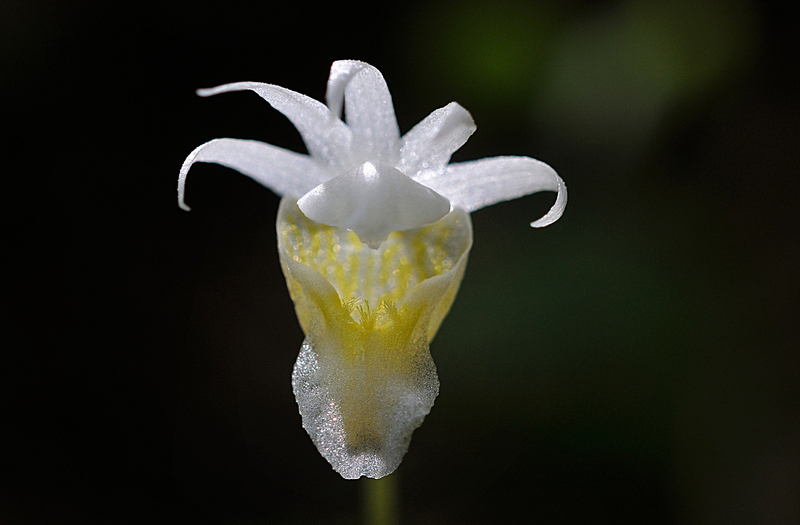 As another “profiteer of climate change” Steinfeld named Himantoglossum hircinum. Climate change was also the subject of my lecture with impressions of this summer on Gotland, Sweden. Jean-Marc Haas also reported about dried out places in Uzbekistan. 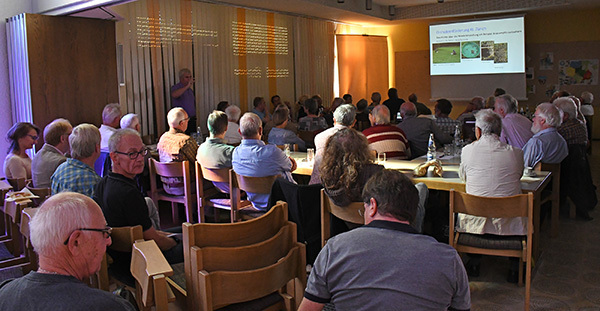 At the conference with more than 60 participants from four countries, which was organized by Harald Baumgartner and Hubert Heitz, Helmuth Zelesny lectured about a field trip to the Golzentipp mountain in Eastern Tyrol, with colour variants of Nigritella rhellicani in white, yellow and carmine. In this region at the edges of the Lienz Dolomites Gymnadenia conopsea is also quite often white-flowered. Hybrids of both species display a big variety of forms. Not so common is the hybrid of Gymnadenia conopsea with Pseudorchis albida. Nigritella rubra is flowering on lime stone. The variety of the orchid flora on this Alpine meadows has also been described by Norbert Griebl in his paper published by AHO-Berichte. Helmut Presser lectured about new taxons related to Ophrys holoserica and Ophrys scolopax in France as there are Ophrys demangei and Ophrys quercophila, the oak loving Ophrys. Hartmut Moeller again showed impressive photos of pollinators, this time he observed Epipactis palustris with potter wasps, bumblebees and beetles.